Jamie Fowler and Kerry Burrows are the first homebuyers at 545 Baldivis land estate. LOCATION proved a major drawcard for the first homebuyers at a new boutique land estate in Baldivis. 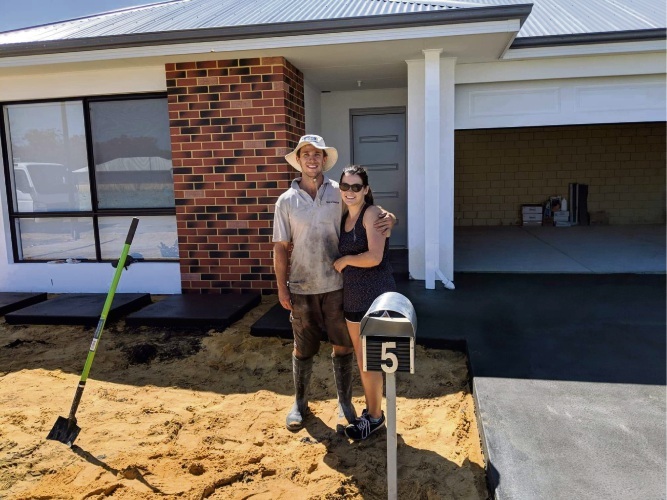 Jamie Fowler and Kerry Burrows moved into their new home at Rockingham Park’s 545 Baldivis four weeks ago. “The estate appealed to us for a number of reasons, the main factor being location, followed closely by price and value for money,” Mr Fowler said. “In the surrounding neighbourhood, you have multiple parks, a scenic bush walk and shopping centres. “There are also two high schools, multiple primary schools, Baldivis Football Club is down the road, the freeway is around the corner and the beach 10 minutes away. “Along the entirety of Baldivis Road, it is very difficult to beat 545 for value,” he said. “We saved over $15,000 on our block, with neighbouring competitors selling the exact same sized land for far more. Home sites at the estate, which comprises 61 lots, have been discounted for a limited time, with some reduced by up to $21,300. Buyers can secure a 302sq m block for $148,000, 375sq m block for $158,000 or 552sq m block for $196,000. Estate manager Kim Yaxley said the price reduction gave people an opportunity to escape the rent trap. “We are launching this major selling spree to give potential buyers the chance to own their own home in a new community surrounded by amenities right on their doorstep,” she said. Mrs Yaxley said homebuyers continued to have considerable buying power due to record low interest rates, the $10,000 First Home Owner Grant for new builds, and builder and developer incentives.